When’s the last time you attended a wearable art exhibition? How about crochet art, specifically? We love that this event of Chili Philly: Crochet Social is taking place in Sydney, created by artist Phil Ferguson (aka Chili Philly). Phil’s absolutely into wearable crochet pieces, whether it’s a teabag as a self portrait or a taco – there are no limits in his vision. His exhibition will be presented with the support of the City of Sydney and in association with the Sydney Gay & Lesbian Mardi Gras 2017. It’s taking place from Tuesday’s to Saturday (11.00am to 4.00pm) from now until the 15th March at the Australian Design Centre. You do need to book tickets as naturally, the expo is widely appreciated and so space is limited and prices for each activity vary. While you’re at the multitude of events, follow and comment on his ChiliPhilly Instagram. Note that he has over 142,000 followers so you’ll need to comment with a BIG statement to get his attention. Using a combo of video and photography, he’ll present a flurry of public program and events where you, the audience, can participate in his self proclaimed ‘crochet craze.’ There’s the (adults only) Cocktails & Crochet evenings, workshops for kids, panel discussions, artist talks and local market makers in Darlinghurst – promoting their accessory ranges. Some of his designs are absolutely off the charts, including this apt LGBT inspired love, crochet heart hat. The events are a fantastic opportunity for visitors to meet locals, locals to bond with locals and corporate business clients to enjoy a unique social gathering versus the obvious (mediocre) wining & dining entertainment options. As the events are taking place just over the water from Cremorne Point, we encourage you to join ChilyPhilly’s workshop, produce a fantastic crochet accessory and tweet us photos. The wilder, more inspiring and the bigger…the better. And when you return to our Manor after a long, yet exhilarating and creative session, let us take photos of you so we can post them on our Facebook page. Maybe the short introduction to crochet will turn you into a hobbyist, or possibly open doors for a future career. Either way, if you don’t grab that hook needle and yarn, you’ll never know what those hands and creative brain is capable of. We’ve something special for you in this week’s blog post. 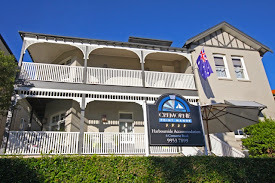 Emerald City Hotels owns and operates a group of accommodation properties including Cremorne Point Manor (obviously), Glenferrie Lodge and Dalziel Lodge. We're running offers that are available from May through August, so you have time to plan your Sydney bound trip. These are intentionally in a word.doc so you can also hit the social accounts and follow each hotel. The offers are ideal for group travels: maybe you’re organising a social event to NSW for your yacht club, possibly for the women’s golf annual excursion or that school trip for the debate team. Our promotions are perfect for you to keep within your travel budget, while having the advantage of being in hotels that are just a short ferry ride from the famous Opera House. Remember to share our offers with friends and family. Hey, someone you know may be getting married this year and now want to host it in Sydney. Not one to boast, but we do have the best skyline views of the Harbour for those 'I do' pics. And we’ll coordinate accommodation for all wedding guests. Take into account that our establishments are small and boutique, so we don’t have hundreds of rooms. This is why customers love us, and keep returning to our hotels. So for large group enquiries, we’ll simply split the guests between all three of our hotels. Not only can you see how the other half live while you stay with us, but you’ll all be close by as our hotels are really near to each other. Yes, we’ve thought of everything. What better way to spend an Aussie autumn or winter than a group trip to Sydney? Click the links below and get booking. Any questions, email, message or call us. Adios!